As we near the Christmas season, there is always an increase in requests for donations to various charitable causes. Some charities are legitimate, however many are not, and a person can find it difficult to determine the difference. Then too, there are many organizations that use a large percent of their donations for salaries, commissions and administrative costs, while a very small portion, if any, actually goes to the need. Most folks have a desire to help the needy, especially during the holidays, and are interested in learning where their gift dollars can be best spent. This has been the scenario in our household each year and recently we have discovered an excellent solution to the problem; that is in the use of beef dollars. One does not have to look very far around your own community to discover people who are not only needy but are very appreciative when receiving a beef certificate. These are not folks who are panhandling on the street, but are quite discreet about their needs, and quite often are elderly. A lot of our elders are on a fixed income, and as one widowed neighbor lady once told me, "There is a lot of month left at the end of my social security check." Quite often, the first thing eliminated, while trying to stretch food dollars, is the purchase of meat. As we all know, this area is not only blessed with the availability of high quality meat products, but are also blessed with organizations whose sole purpose is the promotion of beef. Of course, beef is the mainstay of our tri-state economy. Two organizations that immediately come to mind are the CattleWomen in each state that sell beef certificates in various increments; and "Beef Bucks," a South Dakota non-profit organization formed at DeSmet in 1997. Not only do these two organizations make beef drafts available, but do much more in the way of providing scholarships, sponsoring educational projects, and promoting beef nationwide. 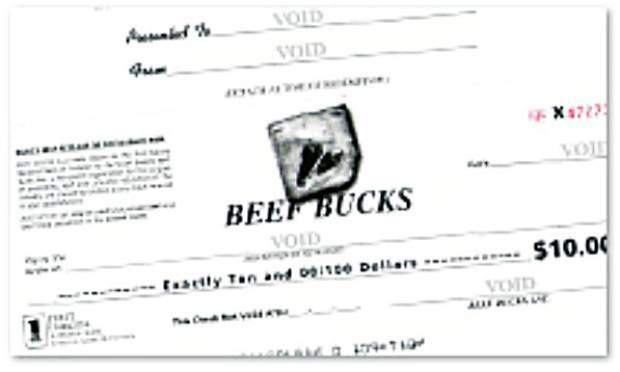 These certificates are sold dollar per dollar and can be used to purchase beef or beef products anywhere in the United States. The certificates, or drafts, can be redeemed in grocery stores, restaurants, locker plants and anywhere beef is sold and will not only help a needy person on your gift list, but help provide them better nutrition through the purchase and use of America's finest produced food, delicious beef! Not just during the holidays, but all year round these beef certificates are handy to have on hand to gift a needy person or have available to thank someone for a service performed. (or check all adjoining state's cattlewomen websites) and "Beef Bucks" at http://www.beefbucks.org or call 1-888-640-MEAT. –Editor's note. Yvonne mentioned to me that she likes to use beef certificates as a Christmas gift to her mailman and others in her community. 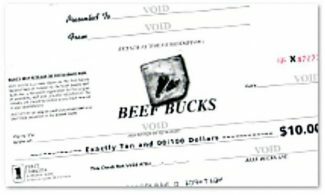 She said she keeps a couple of extra certificates in her purse and will occasionally slip one to an individual she sees in the grocery store who seems to be debating about whether or not to spend his or her limited income on beef. What a perfect way to promote beef and help a neighbor in need.